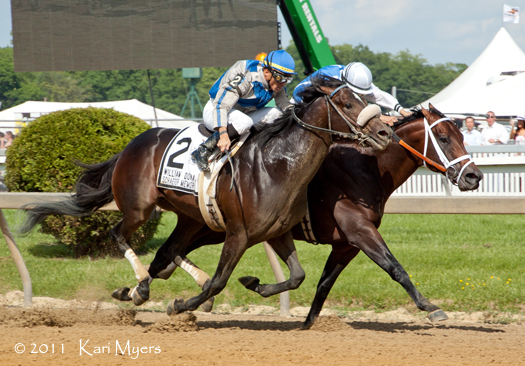 May 21, 2011: Apart (#2) with Garrett Gomez edges up to eventually beat Colizeo with John Velazquez in the Grade 3 William Donald Schaefer Memorial Stakes. There are few things more exciting in any race than a stretch duel between two really game horses. This is the stretch drive in the ’11 Grade 3 William Donald Schaefer Memorial Stakes, which is run on the Preakness undercard at Pimlico. The clean horse on the inside is Colizeo, ridden by John Velazquez. Colizeo lead at every call of this race, but was beaten a neck by the #2 horse, Apart, with Garrett Gomez up. Apart put his head in front right at the wire. Great race!